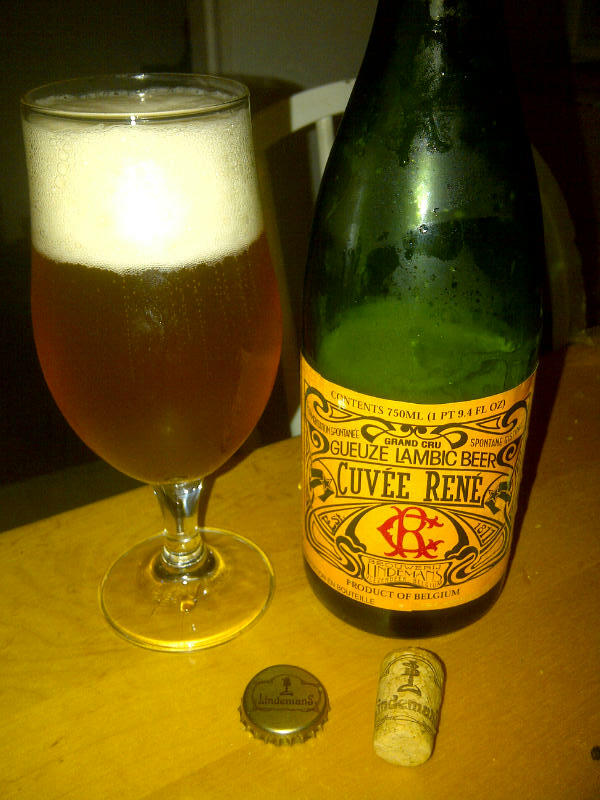 From Vlezenbeek Belgium’s Brouwerij Lindemans comes the “Gueuze Cuvée René” Lambic. The beer pours a cloudy orange with a white head. there is some sediment present in the bottle but nothing that affects the taste. The aroma consists of yeast, apples and other fruits. The flavour is fairly complex with yeast, apples, grapes and more fruit, sugar, pepper and some sour and tart notes. This is one tasty lambic and I am glad that I picked the bottle up! The alcohol content comes in at 5%. Commercial Description: Nowadays, Lambic on draught is hard to find. Only in a few pubs in and around Brussels you still can taste the curious sherry-like flavoured beer. Nevertheless, since 1880, Lambic was bottled to simplify transport but also for conservation properties. This method was the birth of Gueuze: Before the bottling of the Gueuze, a blend is made of 2/3 young Lambic and 1/3 old Lambic. The right ratio young/old is depending on the maturation degree (end attenuation) of each of them. The bottles, with the wild-spontaneous yeast flora, are refermented in the cellar (Method Champenoise). After 6 months the Gueuze obtains a golden color and a cidery, winey palate; reminiscent, perhaps, of dry vermouth with a more complex and natural flavour. Recommended serving temperature is 5 degrees Celsius as per Lindemans website. This entry was posted in Lambic and tagged @merchantduvin, apple, apples, beer, belgian, belgian yeast, belgium, cuvee rene, Europe, fruit, fruits, grape, grapes, gueuze, lambic, pepper, sour, sugar, tart, Vlezenbeek, yeast. This is the only Lindemans that I’m tempted to try. All their fruit lambics use syrups instead of proper fruit mash. So far I have not been a fruit labic fan. I just like a good straight lambic. This is a good one!